There's something lovely about lace. The infinite versatility of this timeless textile has long been the source of inspiration for a wide range of bridal styles. The pattern of a bride's chosen lace wedding dress tells the story of her personality. 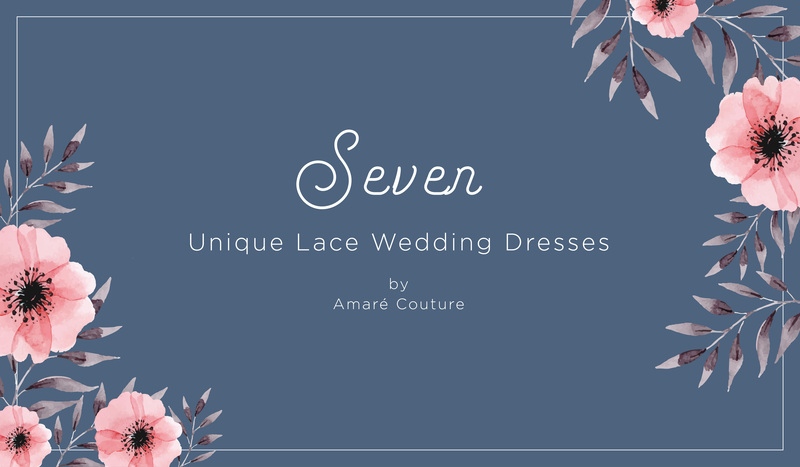 Whether you look for a dress that dons allure or demure details, from bohemian glam to feminine grace, Amare Couture has curated the perfect collection of inspiration for brides who are all about that lace. Style C135 Vivienne is for the bohemian-inspired bride who seeks ethereal elegance without compromising comfort. Perfect for the bride with an appreciation for depth and detail, this wedding dress is designed with guipure lace and an underlay of stretch chiffon. The highly textural pattern creates a striking fit and flare silhouette that makes for a mesmerizing canvas for a sparkling beaded beltline. The natural-edge detail along the v-neckline and keyhole back creates an approachable look and feel while flirtatiously showing a bit of skin. Style C129 Irena is for the upscale princess bride who seeks a look of unassuming luxury. Delicate details of silver embroidery and clusters of sequins dance across her rosy patterns of Chantilly lace to create a magical look and feel. 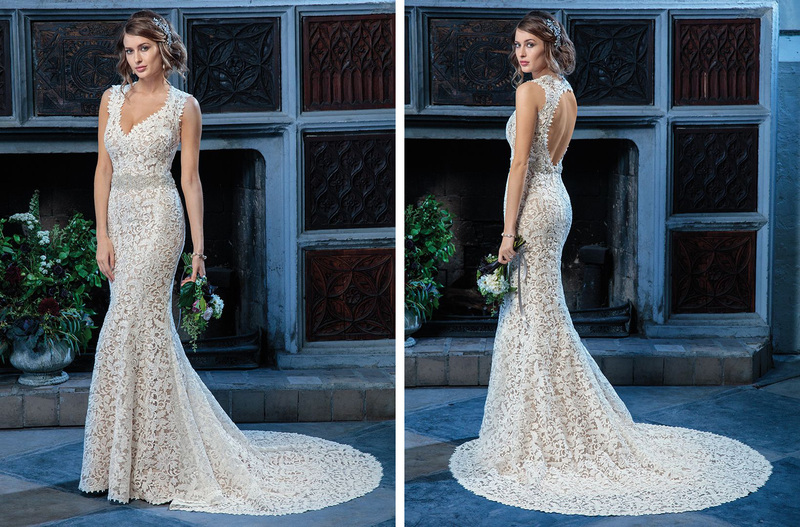 The gentle lace pattern continues to the back of the gown to reveal a dreamy illusion panel. Irena's classic A-line silhouette softly twirls and flows with her light underlay of tulle. A row of rhinestones and beading accent the natural waistline for a final touch of sparkle. Style C126 Vanessa gives feminine romance an updated look of ethereal elegance by mixing Alencon rose lace and silk organza. Her bodice is shrouded in a petal-perfect mosaic of floral detail, creating a flirtatious semi-sheer illusion effect. Her scooped neckline is matched with an alluring low back and is tied off with a silky ribbon at the natural waistline. The lace detail is embellished with drops of sparkle, featuring small clusters of sequins, pearls, and beading. as the petal-perfect patterns delicately drip below the natural waistline. The feminine lace patterns continue as rosy embroidered designs beneath tiered opaque layers of silk organza. Cascading into a full A-line silhouette, each layer of silk organza is accented with horse-hair trimming for textural contrast. Style C139 Serena is for the soft and sultry bohemian bride. Comfortable yet classy, Serena's fit and flare silhouette is made of Chantilly lace and embellished with beaded cotton appliques. The ornate floral patterns catch a touch of sparkle as they elegantly frame the bride's neckline with an alluring plunging V-neck. The lace detail peeks over the hemline of the V-neck, sprawling over her sheer illusion panel. The back of the wedding gown matches the look of romance with a sheer illusion design, framed by a row of petite buttons. The form-fitting stretch chiffon underlay reaches chapel length while the lace overlay stretches out at semi-cathedral length and ends with a dramatically demure eyelash trim. 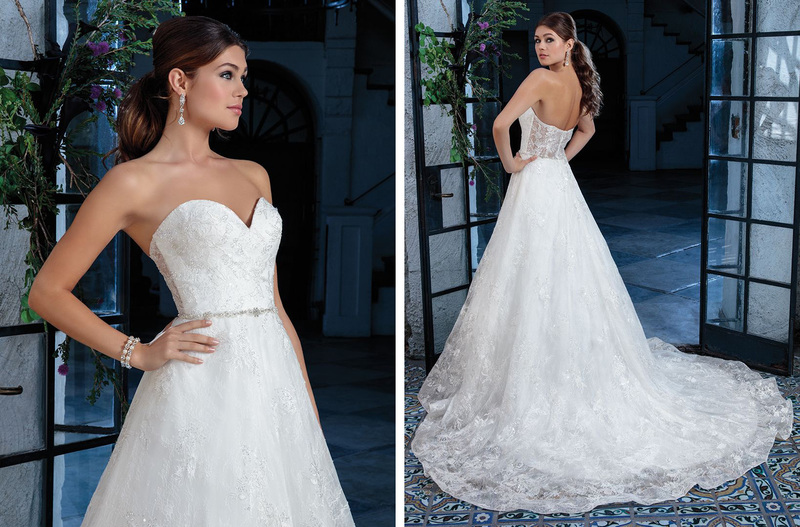 Style C130 Estelle is just the choice for brides who seek two looks in one. Brides can don both a sleeved an sleeveless option with Estelle's beautifully beaded detachable cap sleeves. Elaborate patterns of rhinestones and beading frame the bride's seductive plunging neckline as a sheer panel provides structure and interest. The bride's sides peek through a semi-sheer illusion lace design, meeting an elegant low-back neckline. Creating a perfect combination of romance and glam, Estelle's exquisite fit-and-flare silhouette sparkles as silver embroidered lace appliques and clusters of sequins dance when caught in the spotlight. The textural feel of chantilly lace crates an approachable look of elegance, as the scallopped train finishes with an eye-lash trim. 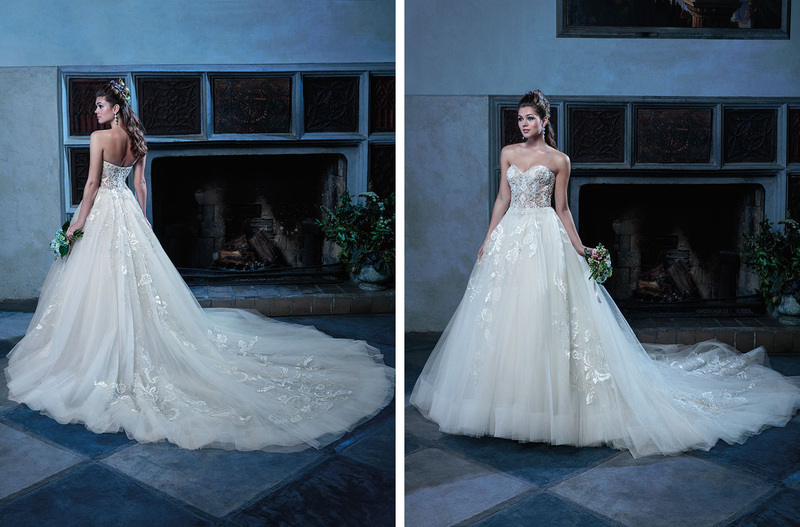 Style C127 Angelique creates a magical medley of girlish grace and elegant romance. Her flirtatious peek-a-boo bodice features ornate beading and embroidery with intricately patterned lace appliques. The floral lace swirls drip down the natural waistline, cascading down the dramatic cathedral length train. Perfect for the bride with an eye for detail, the back of the gown matches the dreamy detail of the front with a beaded illusion back. While the train creates a full ballgown silhouette fit for royalty, the dress remains light and comfortable with her soft tulle underlay. Style C133 Colette is crafted from a honeycomb lace pattern, reminiscent of Alexander McQueen's legendary designs, bursting with textural beauty, this wedding dress is the perfect pick for the bride that seeks a look that is both royal and ravishing. Swirling trails of beads, pearls, and rhinestones frame the low v-neckline while a sheer panel peeks through for subtle structure. The beaded design continues through the straps, creating sweetly scalloped beaded panels that form a diamond-shaped key-hole back. For brides torn between going boho or going glam, Colette effectively combines both. Looking for more Couture inspiration? Make sure to follow us on Pinterest for all the ideas you'll need to create the most perfect wedding. From ceremony details to centerpieces, we have you covered!